The 5" 2-buckle Tracktion Overshoe features the patented Tracktion retractable studded outsole and 100% waterproof, vulcanized black rubber for superior protection in snow and ice. Technology remains flexible in temperatures to -60 degrees Fahrenheit. 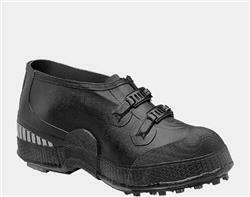 Non-corrosive steel buckles adjust for a comfortable fit, and a deeper heel facilitates ladder work. The 3M reflective material provides visibility in low-light conditions. The 5" Tracktion Overshoe also provides protection from salt, oils, creosote and diesel fuels, making it popular in various industrial applications.